It is spring and Michelle Obama was back in her White House garden today. Nancy Cordes tells us one thing that is already growing is the First Lady's popularity. Bok choy, artichokes and mustard greens. Hard to see many of the homeless lining up for those. 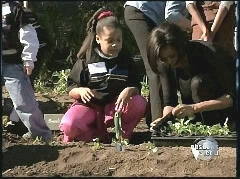 KATIE COURIC: It is spring and Michelle Obama was back in her White House garden today. Nancy Cordes tells us one thing that is already growing is the First Lady's popularity. NANCY CORDES: The First Lady and her army of pre-teen planters added bok choy, artichokes, and mustard greens to the White House garden today, which weathered Washington's wild winter under a cozy plastic covering. MICHELLE OBAMA CLIP #1: Would you ever imagine that what you did last year would lead to all of this? MICHELLE OBAMA CLIP #2: Can I have some hugs? CORDES: Fourteen months into her tenure as First Lady, Michelle Obama is enjoying the kind of popularity her husband would jump through hoops for. 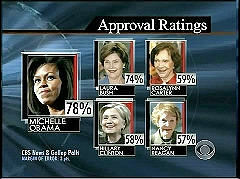 Her approval ratings stand at 78 percent, higher than her recent predecessors at similar points in their husband's presidencies. She has settled on a signature issue: childhood obesity. MICHELLE OBAMA: -because cheese isn't bad, especially when you're a kid. CORDES: Using her clout to chide grocery manufacturers. MICHELLE OBAMA: We need you all to step it up. 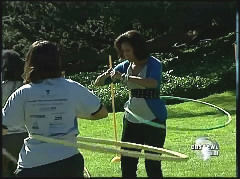 CORDES: Even hula hooping to show children how easy it is to get exercise. KATHERINE TALLMADGE, AMERICAN DIABETIC ASSOCIATION: I love the way that Mrs. Obama has stressed the simple things that people can change to make a huge difference in their lives. MICHELLE OBAMA: There were kids around my neighborhood who would say, “Oh, you talk funny, you talk like a white girl." CORDES: -and granting an interview to right-leaning Fox News before her husband would. MICHELLE OBAMA TO MIKE HUCKABEE: You know, this is a solve-able issue. CORDES: In short, she hasn't been afraid to get her hands dirty, which seems to have gone over well with most Americans. 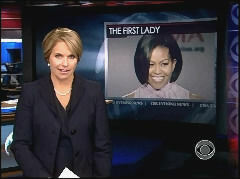 Nancy Cordes, CBS News, Washington.